Julian Saporiti and Erin Aoyama, two PhD students from Brown University, are on a mission to share and perform their musical multimedia project “No-No Boy.” The piece consists of a slideshow and performance of folk songs about Asian-American experiences during WWII, to confront prevailing narratives of that era found in textbooks. Saporiti and Aoyama’s recent presentation at UC Santa Barbara was sponsored by the Transformative Arts Network in the Department of Black Studies and the Center for the Interdisciplinary Study of Music. 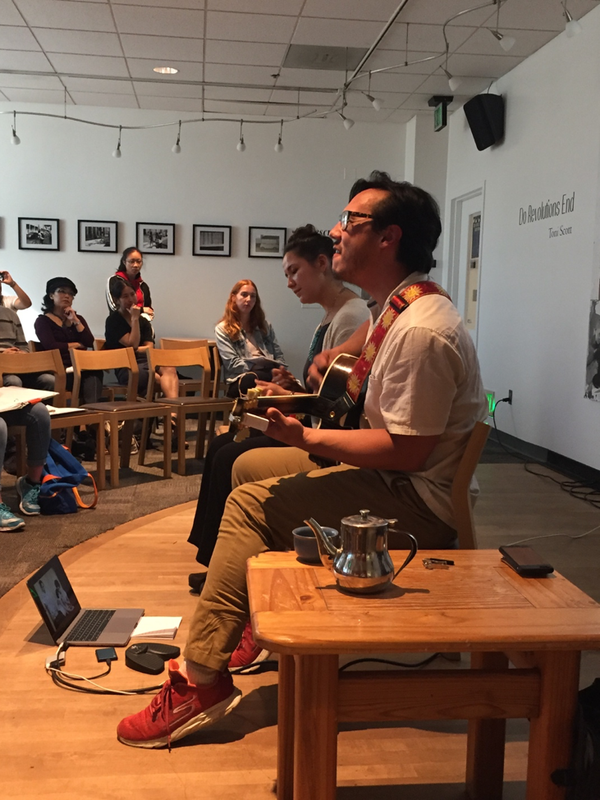 The two performed and discussed ten songs from their project at UCSB’s MultiCultural Center. The folk songs were inspired by extensive research and interviews with survivors from Japanese-American concentration camps. Their entire project is about 60 songs long and explores displacement, citizenship, and trauma. But they also tell stories of romance and the good times. “Please tell my story and do not let it happen again,” said Aoyama, describing how she and Saporiti were instructed by their interviewees to relay that one message as they tour and perform No-No Boy. “We try to shine a light on the names that don’t get spoken,” Aoyama said. 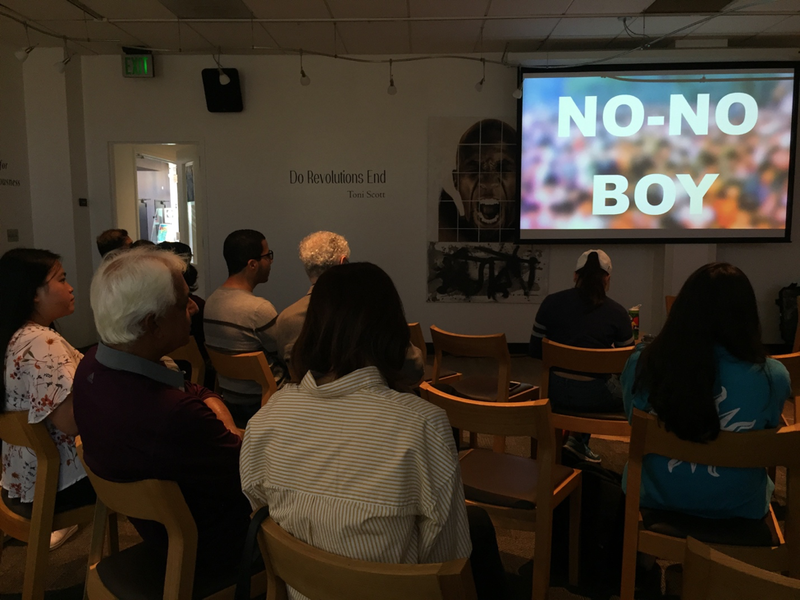 The term “No-No Boy,” refers to the men and women who answered “no” when asked to swear allegiance to the US government or serve in the US army while their families and friends were incarcerated in camps. Saporiti and Aoyama’s project is also personally connected to their own families’ history. Aoyama’s grandfather was a second generation, Japanese-American who enlisted in WWII under the 442nd Infantry Regiment and her grandmother was incarcerated at the Heart Mountain camp at age 20. Saporiti’s family was displaced during the Fall of Saigon in the Vietnam war. The project will also be used as Saporiti’s dissertation to complete his doctorate in American Studies. Saporiti’s artistic approach to academic research is part of a new creative route that is starting to be considered an acceptable standard for dissertations. Kendall Ota, a graduate student in Sociology at UCSB who attended the event, said he would love it if academics weren’t always so formulaic. Saporiti and Aoyama’s presentation has allowed them to travel and share their research with audiences as young as those in middle school. Marissa Garcia is a fourth-year Sociology major and Professional Writing minor at UC Santa Barbara.